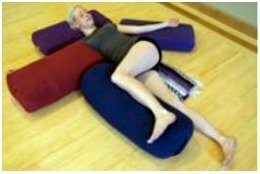 There is a new focus on the therapeutic benefits of restorative yoga flows for breast cancer recovery. Breast Cancer Yoga is a therapeutic flowing yoga that encourages and supports gentle repetitive movements, combined with specific breathing exercises. The use of props are a major component for each pose. This combination of flowing poses, proper breathing and yoga props aids in the healing of the mind, body and spirit. In order for this to happen there needs to be a release of physical muscle tension and a mental letting go of the emotional feelings of fear, stress, anxiety and depression. Breast Cancer Yoga is a kind and gentle flowing yoga that encourages repair and recovery. 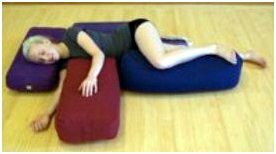 It is restorative; there are no weight bearing poses that could cause pain and no headstands or challenging poses. Flowing poses in Breast Cancer Yoga produce multiple physical benefits when recovering from breast cancer surgery or cancer treatments. The continuous flowing movements have a positive affect on the lymphatic system. When lymph fluid is disrupted through breast cancer surgery, trauma or infection there may be an excessive buildup of fluid. This may create the damaging effects of lymphedema. Stagnant fluid can wreak havoc on the soft tissues and create swelling. There also can be a reduction of oxygen intake or absorption by the lymphatic system - all of which increases the chance for infection. Practicing a flowing yoga keeps the lymphatic fluid pumping throughout the body's channels, rather than accumulating or backing up. This is great for promoting healthy breast tissue. Flowing movements develop a supple spine and a strong nervous system so when the nervous system is in balance, the parasympathetic and sympathetic system work together creating great calm. When flowing in the practice the poses also encourage digestion, assimilation and elimination. The body's immune system is stimulated as well to maintain health. Ultimately this system of yoga encourages and supports recovery back to a balanced state of mind and body. This is where one can learn to lessen muscle and emotional tension, and replace it with self-nurturance, health, vitality and hope.